Please be advised that, while final tasks are being completed for the park expansion, the park managers are currently stationed at site 5. The Province and Osoyoos Indian Band (OIB) have agreed that sx̌ʷəx̌ʷnitk ʷ Provincial Park (Okanagan Falls) will be managed by the OIB. Park visitors can expect the same recreational opportunities as before. sx̌ʷəx̌ʷnitkʷ park is proudly managed and operated by the Osoyoos Indian Band. sx̌ʷəx̌ʷnitkʷ park is located within the traditional territory of the Osoyoos Indian Band. Since time immemorial, the Osoyoos Indian Band’s Okanagan ancestors have inhabited and cared for the lands and waters in their traditional territory. In 2015, the park was renamed to reflect the traditional Okanagan place name for the area. The nqilxʷcən/nsyilxcən place name and history of sx̌ʷəx̌ʷnitkʷ have been passed down for thousands of years through the oral tradition of capti̓kʷl stories and teachings. sx̌ʷəx̌ʷnitkʷ means “little falls.” This place name signifies a connection to the historic Kettle Falls in Washington state. The nqilxʷcən/nsyilxcən place name for Kettle Falls is sx̌ʷnitkʷ or “big falls.” These two falls were two of the most important fishing sites in the Okanagan Nation’s traditional territory. The place name for sx̌ʷəx̌ʷnitkʷ contains unique sounds in the nqilxʷcən/nsyilxcen language that are difficult to translate into the English alphabet. The x̌ʷ is a vibrational sound. Think of the sound of water hitting the rocks at the falls. The i sounds similar to “ee.” The kʷ sound is made with a rounded mouth and sounds similar to a soft “coo” sound. Special Notes: Campground is 100% reservable from May 18 – September 3. Park visitors are reminded that the maximum stay is fourteen (14) nights in a calendar year. Please note that sx̌ʷəx̌ʷnitkʷ park closes annually the third weekend of September for the Okanagan Nation Alliance’s Salmon Feast. The event raises awareness of Okanagan history and culture, as well as the Okanagan Nation’s efforts to revitalize and restore sockeye salmon numbers in the Okanagan River. Everyone is welcome to attend the celebration, but the campsites are closed to the general public on this weekend. More information is available at www.syilx.org. Audio Files: The nqilxʷcən/nsyilxcən place name for sx̌ʷəx̌ʷnitkʷ park was recorded by Osoyoos Indian Band Elder Jane Stelkia and Westbank First Nation Elder and language teacher Delphine Armstrong. Jane’s nqilxʷcən skʷist (traditional name) is qʷʕayxnmitkʷ xʷəstalk̓iyaʔ. Delphine’s nqilxʷcən skʷist (traditional name) is ɬək̓əmxnalqs. Located on Green Lake Road, approximately 500 metres from the junction of Hwy. 97 and Green Lake Road. Use caution, narrow road with blind corner. At the town of Okanagan Falls. 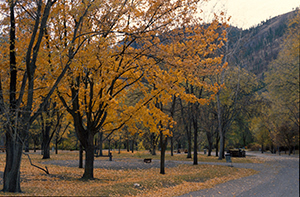 History: sx̌ʷəx̌ʷnitkʷ park has a long history of use by the Osoyoos Indian Band and the Okanagan People. The park is located within the traditional territory of the Osoyoos Indian Band. sx̌ʷəx̌ʷnitkʷ park was part of an historic reserve allotment to the Osoyoos Indian Band. The reserve was set aside in 1877 for fishing purposes, but was cut-off in 1913 by the McKenna-McBride Royal Commission to meet settler demands for more land in the region. In the 1950s, the falls that gave sx̌ʷəx̌ʷnitkʷ park its name were blasted to make way for a flood control dam. The present day park was established on March 16, 1956. In 2015, the Province and Osoyoos Indian Band agreed that the Osoyoos Indian Band will manage sx̌ʷəx̌ʷnitkʷ park. Cultural Heritage: sx̌ʷəx̌ʷnitkʷ park has archaeological and cultural heritage significance to the Osoyoos Indian Band and the Okanagan People. There are several archaeological and cultural heritage sites and landforms within the surrounding area that tell an important story about how coyote brought salmon to the Okanagan People. For thousands of years, the Osoyoos Indian Band’s Okanagan ancestors used, occupied, lived, camped, traded and fished at sx̌ʷəx̌ʷnitkʷ. Historically, Chinook, Coho and Sockeye Salmon were fished in abundance at sx̌ʷəx̌ʷnitkʷ. Today, however, due to extirpated (Coho) and endangered (Chinook) salmon populations, sockeye are the only salmon species fished at sx̌ʷəx̌ʷnitkʷ. Please help respect and protect this historically and culturally important area by following the park rules and reporting any suspected archaeological or cultural heritage objects to park staff. Park guests are also reminded that Heritage Conservation Act protects all archaeological and cultural heritage sites in the province. This includes intact or disturbed, known or unknown, recorded or unrecorded sites. Conservation: This park conserves riparian vegetation that is important habitat for a variety of bird and bat species including the red listed Pallid bat. Wildlife: The park offers superb bird watching, with sightings of Western wood peewees, Yellow warblers, Northern orioles and Least flycatchers. There are wildlife viewing, nature study, and photography opportunities here and the park contains habitat for 18 species of bats, one of the highest concentrations in Canada. A trail runs along the dike on the west side of the Okanagan River through the campground and continues south outside the park boundary. There is an interpretive sign developed by the Okanagan Nation Fisheries Commission with information on the fishery, both past and present, in the Okanagan River. It is located beside the campground. There are two pit toilets beside the service area and two flush toilets closer to the park entrance beside site 2. This park offers 25 vehicle-accessible campsites nestled between the Okanagan River and the steep foothills of Mt. McLellan. All of the sites are reservable from May 18 to September 3. An information shelter is located at the beginning of the campground loop. The medium to large sized, well spaced sites are separated by irrigated lawn and a variety of deciduous trees that provide shade in the summer and a splash of color in the fall. There are few shrubs, resulting in an open, bright campground. The sites are gravel pads and have a fire ring and picnic table with BBQ attachment. Roads in the park are level and paved and one of the flush toilets is wheelchair accessible with a paved path leading to it.